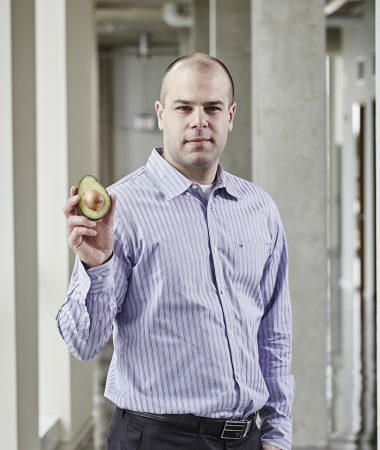 New funding will allow a University of Guelph professor to study use of avocado compounds in fighting cancer. Food science professor Paul Spagnuolo will begin a four-year, $200,000 study of an avocado-derived leukemia drug. His study will receive funding from the Ontario Institute for Cancer Research (OICR) under its Transitional Research Initiative, intended to bring together researchers to develop Ontario innovations for treating cancer patients. Spagnuolo will work with an anti-AML (acute myeloid leukemia) drug. “Our drug doesn’t kill healthy cells, but targets cancer cells in a very unique way,” he said. Few treatment options exist for children or elderly patients with leukemia. Spagnuolo developed the drug while a professor at University of Waterloo, intending one day to get it to clinical trials for patients with AML. Earlier, he worked with clinical hematologist/oncologists while completing his fellowship at Princess Margaret Cancer Centre in Toronto. Most of the new research will be done in Guelph; Spagnuolo will collaborate with cancer researchers at the University of Toronto, Princess Margaret Cancer Centre, Ottawa University and McMaster University. “We are getting close to this drug being tested in patients, but as is typical with these sort of endeavours, more funding is needed,” he said.